It has become a common practice these days that whenever the Cupertino-based Technology giant Apple announces a new device, iPhone or iPad it may be, tech geeks waits anxiously to get their hands on it with an aim to tear it apart. As I mentioned that it has become a regular practice, Apple’s new iPad has also gone through the same treatment. Along with several others, IHS iSuppli also got their hands on a new iPad and the team there had nothing much to with it except for tearing it down with an aim to find out just how much this new device costs the Cupertino-based tech giant to make, and how much the device is supplementing to the company’s world famous bottom line. Certainly, the answer depends to a large extent on the number devices sold, but one thing is obvious that the company is making huge profit on each unit sold. 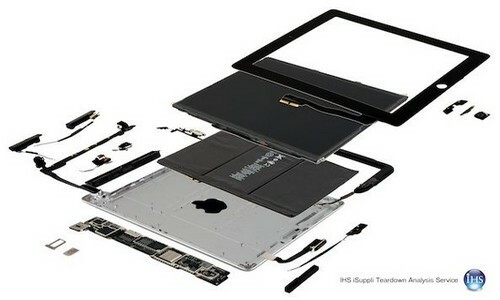 As a matter of fact, the new Retina Display introduced in the new iPad is not inexpensive. As it is said that the new Retina Display is provided by Samsung, and with Sharp and LG expected to come on board as well, the display could cost the company as much as $90 depending on the manufacturer and volume. You may not found it a lot, but it is certainly about a quarter of the finished device’s retail value. If we move further on, the low-end 16GB Wi-Fi iPad took Apple to invest almost $316 to make it, with the retail price being set at $499. iSuppli points out that with such a scenario, Apple is making a profit of about 37%. Similarly, with the increase in retail price, the profit automatically increases. The 64GB 4G model costs Apple $409 to make, while being sold at $829, which means that Apple is making a profit of about 51%. Certainly, with the increased trusts of customers in its products, Apple is hoping to make huge profits.